ENDODONTIC MICROSURGERY | APICOECTOMY | Arielle Chassen Jacobs, D.M.D. In some cases, root canal therapy is insufficient to save your tooth. In such a situation, your endodontist may recommend alternative strategies, which may include endodontic microsurgery. There are several situations in which surgery can help save your tooth where normal root canal therapy would be lacking. The most common type of endodontic microsurgery | apicoectomy is called an apicoectomy, or “root-end resection”. When the tooth’s infection or inflammation spreads to the bone material around the tip of the tooth’s root after a root canal, your endodontist may need to perform an apicoectomy. In some cases, tooth roots are too narrow to fully operate in because of mineral deposits referred to as “calcification”. If this is the case, endodontic microsurgery would be needed for your tooth to be completely cleaned and healed. In some rare cases, normal root canal therapy may be considered successful, but symptoms or problems may persist, or reoccur later – possibly months or even years after the original procedure. In these cases, apicoectomy can still be an option in order to save the remaining tooth. If the tooth disease has spread to the surface of the tooth root or if an infection has spread into the surrounding bone material, apicoectomy may be required to treat these areas. 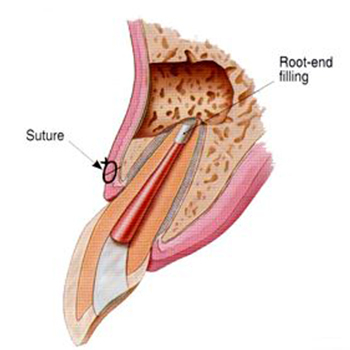 An apicoectomy, or root-end resection, is the most common surgical procedure performed to save a tooth should infection or inflammation persist following a root canal. 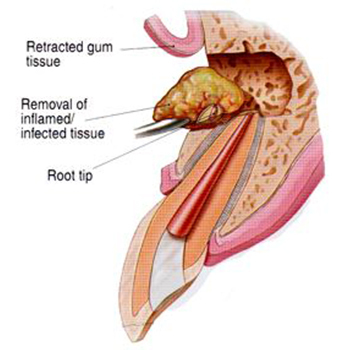 In this image the gum has been retracted and the infected tissue is shown being removed. 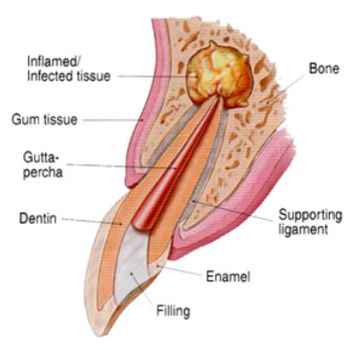 After the removal of the diseased tissue and the root tip, the tip is sealed with a small filling, the gum flap is sutured back in place to aid the tissue to properly heal. 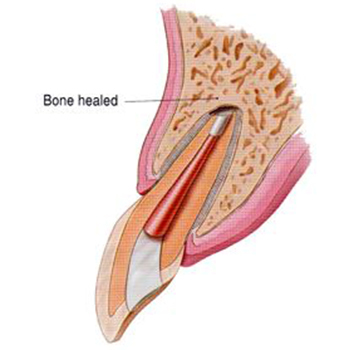 After a period of months, the bone heals around the end of the root. Generally the only alternative to endodontic surgery is extraction of the affected tooth. It must then be replaced with a bridge, a removable partial denture or an implant to restore proper chewing and to prevent adjacent teeth from shifting. Because these alternative procedures usually require dental procedures on adjacent health teeth, endodontic surgey is usually the most cost-effective approach when faced with a root infection.